KUWAIT: The main nationalist opposition group yesterday reiterated that it will not end its boycott of the National Assembly elections. Former MP and leading member of the opposition Popular Action Movement (PAM) Khaled Shukhayer said the movement will not take part in the election, but will not criticize opposition members who decide to participate. He said PAM members will not contest the election as long as PAM secretary general Musallam Al-Barrak and other leading members are behind bars. Meanwhile, 41 new candidates registered for the elections yesterday, raising the number so far to 291 hopefuls for the Nov 26 snap polls. Two members of the dissolved Assembly, Abdullah Al-Adwani and Talal Al-Jallal, filed for re-election, while the main surprise was veteran ex-MP Abdullah Al-Roumi, who filed his nomination papers from the first constituency. Roumi, who represented the constituency several times and was deputy speaker for one term, said the main focus should be fighting corruption, blaming the government for failing to do so. 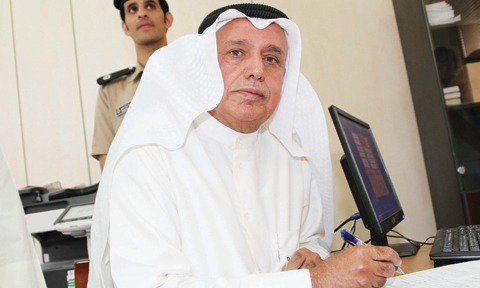 He said the Kuwaiti people should fight corruption through the best selection of candidates to safeguard the nation. Roumi said the last period was very bad from both the government and the Assembly and called on the opposition to take part in the polls. Other main candidates included Osama Al-Tahous, who was pronounced a winner in the 2013 election, but later the court decided there was an error in the sorting of ballots and awarded his seat to Nabil Al-Fadhl, who died over a year ago. Tahous said that the dissolved Assembly committed a number of grave constitutional violations, saying that several cases of aggression against public funds were committed, adding that members of the previous Assembly failed to protect the rights of people. Former MP Nawaf Al-Fuzai said the government will not be able to raise the price of petrol “if we get elected, as we will defend the rights of Kuwaiti people”. He said that the dissolved Assembly had squandered the rights of people and conceded many of its rights, becoming a puppet of the government. Fuzai said as a result of the Assembly surrendering its powers, corruption became rampant and widespread.